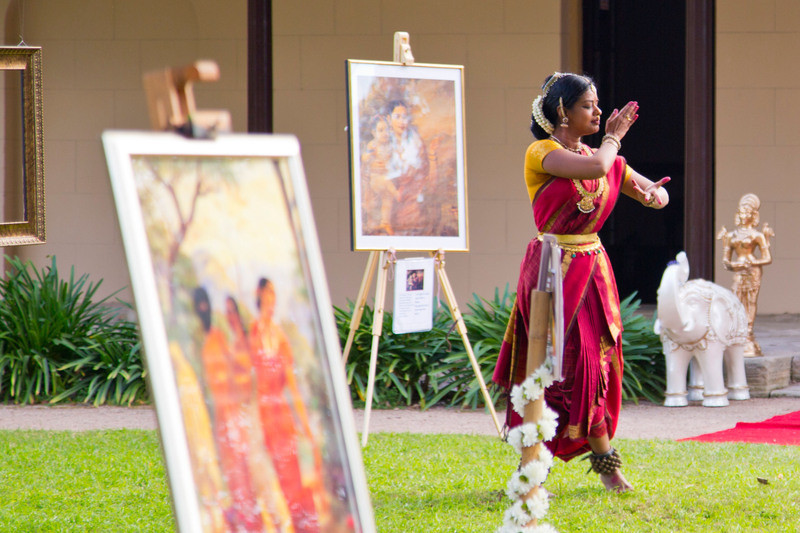 Conceived by Sumathi Krishnan, a local classical vocalist, she teamed up with cellist John Napier and Aruna Gandhi, a Bharathanatyam dancer, student of the Padmasree Sudharani Raghupathy a couple of months ago to present the Dreaming Damsel at the Anywhere Festival 2015 partnered by the Parramatta City Council and the Parramatta & District Historical Society. The paintings were proudly exhibited accompanied by the poetry written by Rekha Rajvanshi and Anu Shivaram for each of the paintings. 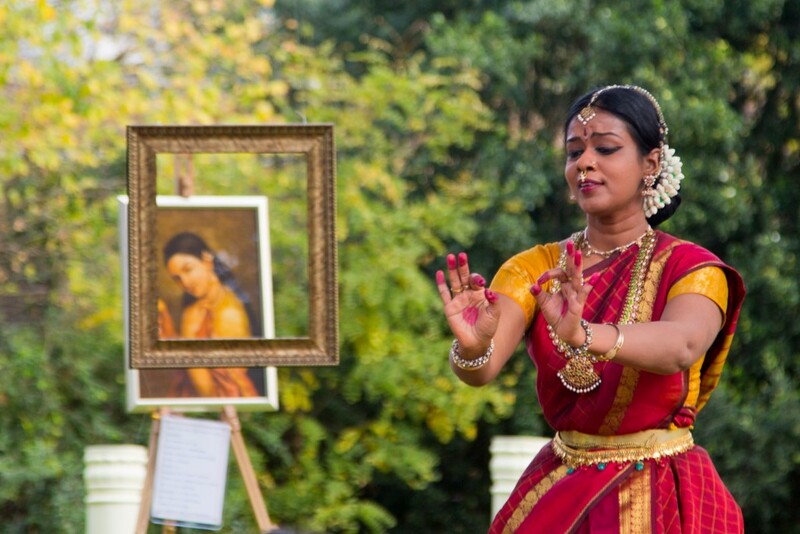 The verandah and gardens staged and set up with artefacts like a Royal Palace the audience was transported to a dreamlike bygone era. Sitting on the edge of theatrical work, the production commenced with the verbal rhythmic exchange between two accomplished percussionists, mridangist Pallavarajan Nagendran and tabla player Abhijit Dan followed by the melodious voice of Sumathi Krishnan. The story of Shakuntala is told through John Napier’s poetic rendition of Kalidasa translated by Arthur W Ryder followed by Sumathi Krishnan’s rendition in Raag Yaman ‘Mohe Apne Hi Rang me Rang Le’ an Amir Khusrao’s composition. 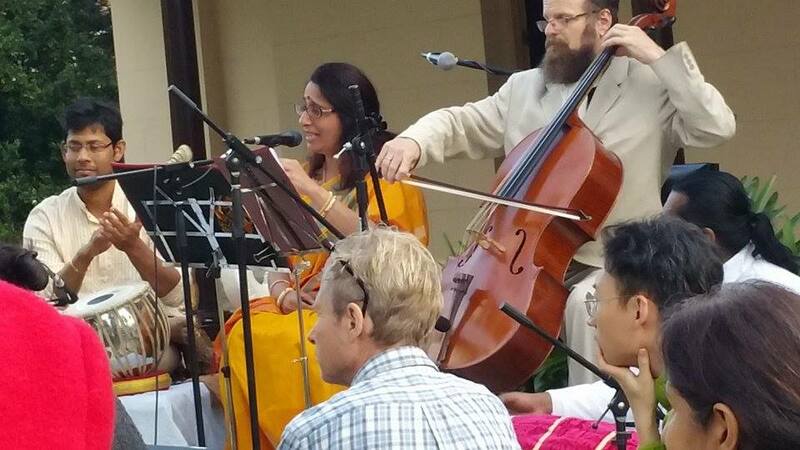 overlapped by the overtones of Madhuwanti alap by Sumathi Krishnan we are enveloped by the deep sounds of the cello resounding over the lawns and grounds as he slowly unravels in a dhrupad style of rendition Raag Madhuwanti ending in a fast and furious climax. No sooner had this finished we find the poets Anu Shivaram and Rekha Rajvanshi render their poetic versions of the painting which is followed by 9-10 Century tamil text of Divya Prabandham, interlaced with poetic rendition in English as the young Andal depicted by Aruna Gandhi dreams of marrying her Lord Vishnu in a ragamalika. Dream Such was my dream, Majestic like a lion, With 1000 elephants he entered, Lanes, streets and city abound celebrate, As adorned in flowers I await .. Dream Such was my dream. As Ganges flows out of Shiva’s dreadlocks so did the percussionists united efforts in a rhythmic exchange take the audience to the Himalayas as they see it come to life in a quick live painting by Murthy. This is followed by the concluding thillana ending in joining of all artforms as Murthy finished sketching the painting dancer Aruna Gandhi in her sculpturistic pose. “The entrancing diversity in the production kept the audience at the edge of its seats” says President of the Heritage Society Brian Powyer. To add to the ambience were the ‘Living Sculptures” Devaki Parthasarathy dressed in nine yards saree with cute bun, Rekha Rajvanshi dressed as a muslim lady, Anu Shivaram as a Kannada lady with her nose ring and Sirisha Anupindi clad in a beautiful simple saree – each added that theatrical touch. 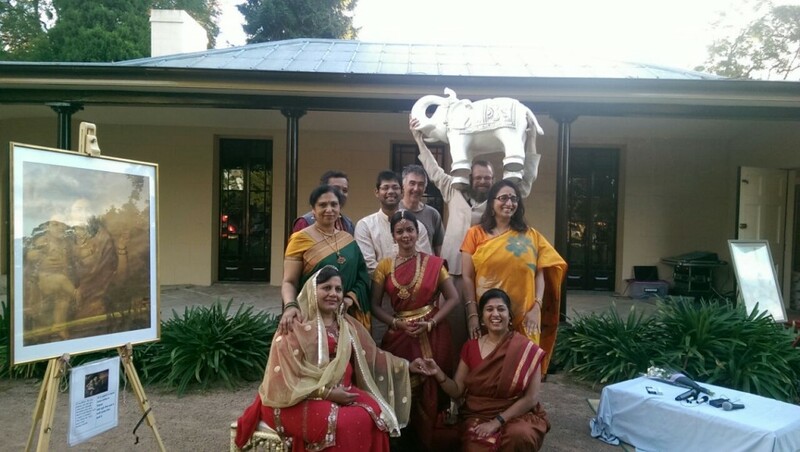 Each Sydney’s own Raja Ravi Varma damsel !